Senior Spotlight: Jake Ecke | The Gettysburgian. Senior Jake Ecke (Photo Courtesy of Gettysburg College Athletics). 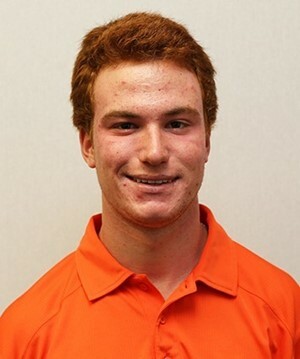 The Gettysburg College men’s golf team has performed at an elite level throughout the spring season. Competing in six different tournaments and invitationals the Bullets have finished in the top four in all but one. Helping a young team stay this consistent is lone senior Jack Ecke, a political science major from Prospect, Connecticut. Averaging 80.8 strokes per round this year, Ecke has been a solid presence on the team this season. Yet his success is nothing new. Over his four years with the Bullets, Ecke has come to boast a career average of 80.0 strokes per round, putting him just outside the top 15 players in the Centennial Conference. Ecke recently shot a career best 73 at the Dickinson Spring Invitational where he finished in a five-way tie for fourth place. The Bullets finished second by seven points that day. Ecke finished second for the team, just behind junior Danny Harcourt. Ecke’s performance at Dickinson College puts him below the lowest scoring average of the top players in the Conference for the season. His ability to get hot at the right time could prove essential at the end of the season, as he moves up in Conference standings. The Bullets will look to close out their strong season this coming weekend at the Centennial Conference Championships hosted by Muhlenberg College at Brookside Country Club in Macungie Pennsylvania. Ecke will definitely be a strong performer this weekend in his final tournament for the Bullets as the currently third-place ranked team looks to fight for a Centennial Conference crown. Alex Petrecca ‘19 is a staff writer for the Gettysburgian who writes primarily for the sports section. He is from Fairfield, Connecticut, and is a fan of the New England Patriots. He is a captain of both the Cross Country and Track and Field teams, and is majoring in Health sciences. Follow him on Instagram @alex_Petrecca.